In this eighth-grade humanities lesson, students watch a short video about the 2010 fight by the Coalition of Immokalee Workers for a penny more per pound of tomatoes picked, and read an article that describes where consumer food dollars go in the food system. Students make posters that synthesize the information, and discuss the roles consumers, government officials, and food system workers play in working for a more just food system. This is the fourth in the Debate Plate lesson series, a six-lesson series that focuses on factors and considerations that influence personal food choices and the impacts of those choices. Understand that their food choices as consumers impact other people within the food system. Discuss the relative proportion of the money they spend on food that goes to each player in the food system, and compare how these proportions vary depending on the characteristics of the food system. Begin to form opinions and build arguments around the theme of justice/injustice in the food system, and consumer responsibility in regards to food choices. Connect consumer choices to farmworkers’ lives by reflecting on the impact paying one penny more per pound for tomatoes would have on the Immokalee Workers’ pay after watching a video by the Coalition of Immokalee Workers (CIW). Discuss their thoughts, reactions, and opinions in regards to the CIW video and “Where Does Your Grocery Money Go?” article. So when we’re talking about labor in relation to the food we eat, what, or who, do you think we could be talking about? To put it another way, who are some of the people who work on getting food from the farm to your plate? Tell students this is just a preliminary list that you’ll add to as the class goes on. Today, as we look at labor and justice in the food system, we’ll be focusing mostly on the work that farmers and farmworkers do and the compensation they receive for that work. Clarify that “farmers” usually refer to the people who run the farms, and they may or may not actually work in the fields, and “farmworkers” are paid by the farmers to do manual labor on the farm—anything from planting to fertilizing, spraying pesticides if the farm is not organic, and harvesting. In 2011, a group of farmworkers in Immokalee, Florida, launched a Campaign for Fair Food to fight for higher wages. If you have ever eaten a tomato in the winter, it probably came from Florida, and possibly was picked by one of these workers. Hopefully, that gives you a sense of the type of work farmworkers do, and the conditions workers face on the job. In that video, the workers were asking for just one penny more per pound that they picked. Now we’re going to jump into some specifics on where the money that you spend at the grocery store goes. In a less-industrialized food cycle with fewer people and processes between the grower and consumer, a much larger proportion of your food dollars – even up to 100% - goes directly to the farmer and farmworkers. 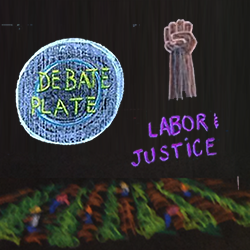 Make-a-poster activity: Students make posters summarizing what they think is the most important or interesting information for people to know about labor and justice in the food system based on the video and article. If there is time, students share the posters with the whole class or in small groups. Should consumers be responsible for knowing about their food in terms of justice around production and labor practices? Should consumers be responsible for buying food from responsible sources? Paying more for food? Is it the government’s responsibility for making laws around fair pay? What might barriers to making “responsible” consumer choices be? What would be a deal-breaker for you around supporting a company or product? What is the responsibility of the consumer in terms of being informed about their food? Are there any things you have learned about food that affect how you make food choices? Are there areas you feel are more or less important to be informed? Are there disagreements in your family about food choices? Are there any things that you would change about how you eat or the food available to you, but are not able to? Have you experienced not being in control of the decisions that affect your conscience as a consumer? Do you have a conscience as a consumer? What are the areas that you do feel empowered to make choices around what you consume? Thank students for their participation in the class, and tell them that they’ll continue to explore the theme of labor and justice when they return to the Kitchen. Article: Where Does Your Grocery Money Go?